Here comes another book in the wonderful series of books - "Nothric's Amazing Bible Stories for Kids". In The Beginning… is the beginning of the entire Bible and will teach kids the very start of what we call our universe and our world. It's a great starting point for kids of all young ages to begin to learn. It's easily accessible and a great addition to any series of Bible teachings you currently have. Now come with us and enjoy the colorful illustrations of "Nothric's Amazing Bible Stories for Kids : In The Beginning…". 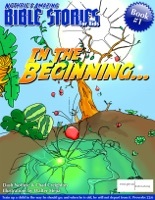 Finally I get this ebook, thanks for all these Nothric's Amazing Bible Stories for Kids: In the Beginning... I can get now! Nothric's Amazing Bible Stories for Kids: In the Beginning... was the best books I ever buy. Nothric's Amazing Bible Stories for Kids: In the Beginning... did exactly what you said it does. I will recommend you to my colleagues. Nothric's Amazing Bible Stories for Kids: In the Beginning... is the most valuable books we have EVER purchased. I'd be lost without this. I am completely blown away.